Luang Phor Toh was born on 27 March 1887 (BE 2430) Bang Kon Tee District in the Samut Songkram Province. He ordained as a monk at the age of 20 and become the Abbot of Wat Pradu Chim Phli at the age of 26. Luang Phor Toh was a dedicated and a merciful monk, he was highly respected by the locals and even his Majesty the King would pay homage to Luang Phor Toh. 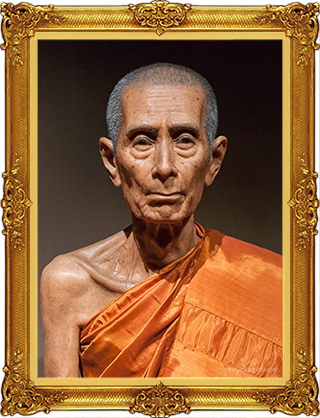 He practiced Dhutanga (ascetic practice to remove defilements), traveling extensively within and outside Thailand. Luang Phor Toh had a passion to learn more about Lord Buddha's Dhamma and magic sciences. He is the most famous modern-day guru monk in making Phra Pidta's, known to be extremely efficacious especially in kaew Klad (free form harm). He passed away on 1981 (BE 2524) at the age of 94 and was granted royal funeral rites and ceremonies.